Buried deep in the bowels of this blog are several posts I did about sailing with no racing - just kicking back in a pleasant breeze - the zen of daysailing. As winter makes its approach in the Mid-Atlantic it is good for the soul to watch the zen of daysailing, basking in the tropical sun close to the equator; in this case Tenerife, one of the Canary Islands. I keep doodling around with Classic Moth designs. Below are two; a round bilged design loosely based on my Maser and another modified Cates design. These are DXF files which can be imported into various drafting or 3D programs. Hover your mouse pointer over the right corner of the drawing and click on the arrow icon (top right corner of drawing). The drawing will open in another tab on your browser and you can download from there. Dimensions in both drawings are in meters. The Cates design was the dominant U.S Moth of the 1960's. As I've been listening to the history of the class, there were many builders that added their own touches to the Cates, pushing the design in various different ways. In this vintage tradition of modifying the Cates, here is one of mine. I've added a flat rocker panel to bump up the displacement to accommodate the increased girth of senior skippers. Also, on this version of the Cates, the original V'eed transom gives way to a shallow curve. Again, section placement is given in meters. We American's are just finishing up our Thanksgiving feast weekend, Roast, baked, or fried turkey is the centerpiece and carving the turkey into white or dark meat pieces is all part of the tradition (and then add the gravy, stuffing, oyster or regular, mashed sweet or white potatoes, cornbread, vegetable casseroles of all sorts ..... well, you get the idea). And surprise, surprise, an American in the lead in this one! A previous post about Laser carving. Roland Hunn shared with me the program for the 1948 Duster Nationals at Riverton Y.C. (Roland's uncle, Ted Hunn, was president of the class in 1948). 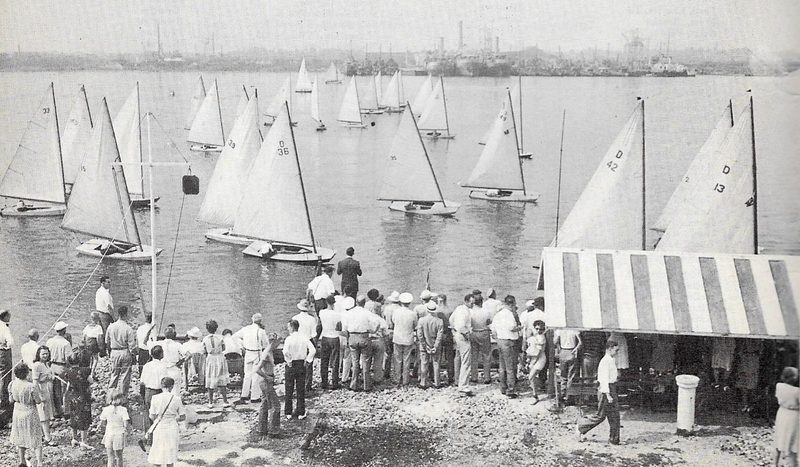 In the program was this photo of the Duster fleet starting in a drifter. The Duster class was a local New Jersey singlehander. My previous post on the Duster. The previous header photo was the Australian, two-man, NS 14 dinghy "going down the mine" off of Anderson's Inlet, South Gippsland Yacht Club, Inverloch, Victoria. The NS 14 is an indigenous Australian development class; a two person hiking, no spinnaker class. It is 4.27 meters (14') long and 1.8 meters (just under 6') wide. 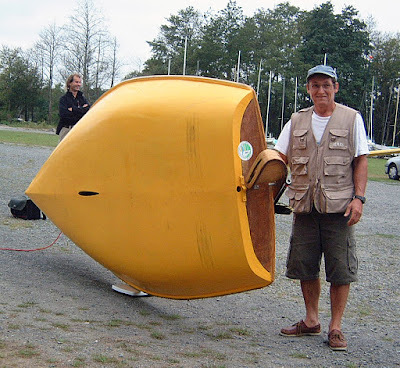 Those who have read Frank Bethwaite's High Performance Sailing know that Frank's first forays into dinghy design experimentation were in the NS 14 class and that his successful NS 14 designs were the basis for his one-design Tasar. The 1960's NS 14 fleet. Six older NS 14's were imported into the San Diego area around the new millennium and when that effort of fleet building stalled, one or two were brought east, specifically to the West River Sailing Club, with transplanted Aussie, Tony Arends owning one. Sadly I was never around the club when they showed up and missed the chance to take one out for a spin. West River SC already had a fleet of Jet 14's so the NS 14 was again a non-starter in the United States. I'm not sure what happened to the boats. The somewhat smallish 9.3 sq. meter sail plans features the now de rigueur square-top (or nearly a square-top) main. The fleet uses a very deep over-rotating mast for more power. The NS 14 has the modern, double bottom, full draining interior. To save weight the reverse sheer profile is very "humpy", aggressively turning down at the stern. Our impressive duo from the header photo, après pitchpoling. It's getting chilly in the Northern Hemisphere. 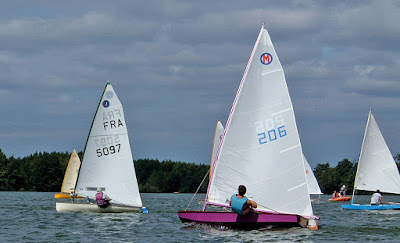 Time to sit at the computer (or tablet, or smart phone for those more technically advanced than the blogmeister) and watch several videos of dinghy sailing fails from 2015. The International 14 will humble anyone, anytime, talent or no talent. A Dazzling Display of Talent: Pt. 1 from mothra64 on Vimeo. Training in a singlehander when we are that one step behind all day. Glug! Glug! All good in the end. AnotherDayAtTheOffice from #1710 on Vimeo. I've seen lots of Opti videos but not one that shows them filling their ballast tanks (and then emptying them). Well this one does. The baby 49'er, the 29'er, can be just as squirrely as its bigger brethren. November Sailing from Samuel Bonin on Vimeo. Other bloopers, fails, capsizes from Earwigoagin can be viewed here. Music Whenever: Jeremy Buck "Turn My Ship Around"
Another song with a strong, catchy electronic beat. Nothing complicated about the lyrics but at least they have a a nautical theme. The video also features Circusman Alexis, aka "The Wheelman." Nuff said. The best photo there is of a sailing dinghy on the edge of control. An Historical Australian 18-footer but I don't have anything else, such as the name of the 18-footer, or the date. I assume the photo comes from the archives of the Australian National Maritime Museum which has done a superb job of releasing historical photos onto the Web. Update: Neil Kennedy comes forward with the complete history behind the photo. "The 18ft skiff is Crows Nest II ( ex Almae) taken in the 1952 season on Sydney Harbour. The helmsman is Cliffie Monkhouse who was one of the legends of Sydney 18ft skiff sailing. 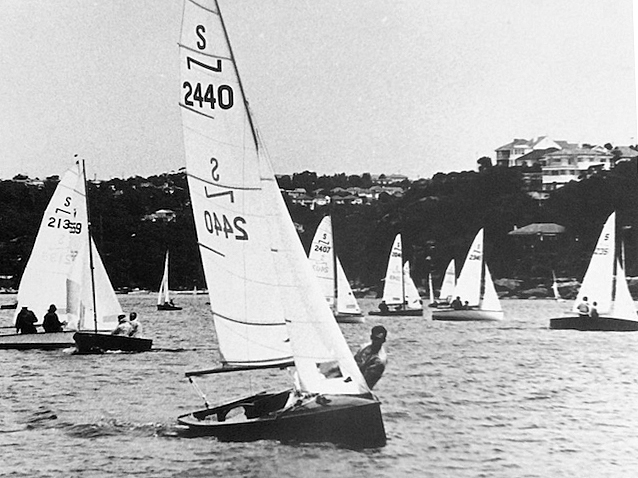 The following season 1953 he sailed the first of his skiffs named Toogara and continued with a series of skiffs of the same name until the 1965 season. His sail insigna of a black shield with a red ball was instantly recognisable. The photo itself is one of the many fabulous pictures of 18 foot Skiffs in Robin Elliots book "Galloping Ghosts" the story of Australian 18ft skiffs 1890-1965 which was first published in 2012. The frontispiece for Robin Elliott's book "Galloping Ghosts". A few of the Robin Elliott book are available on Ebay. I was under the mistaken impression that there were only two singlehanded dinghy design competitions over the last fifty or so years; the three IYRU singlehanded trials in the 1960's that would select the Contender to replace the Finn (NOT! ), and the more informal singlehanded trial weekend in 1970; the American TeaCup regatta sponsored by the One-Design and Offshore Yachtsman magazine in which the Laser, and the cut-down Flying Junior, renamed the Banshee were introduced. It was up to a transplanted Frenchman on the Left Coast, Dominique Banse, to correct me. He sent along a 2001 article from the French traditional yachting magazine, Le Chasse Marée which reported on a singlehanded design competition they hosted for Classic Moths. 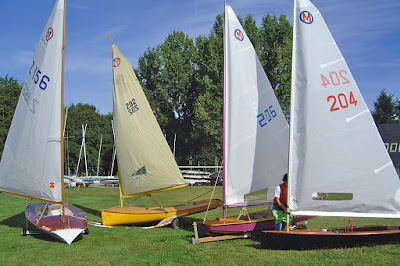 The regatta was run by the sailing club, ASPTT Voile de Nantes, and over twenty Moths showed up; some old, some new. Eighteen different Moth designs had been submitted to the magazine but only six new Classic Moths actually showed up to test their designers thinking on the race course. Unfortunately several of the new ones were not ready when they rolled in on the Friday and it took the midnight oil to get them on the water. Not the best way to prove your racing mettle! Two of the designs, Mariposa and Francois Vivier's Moth Grand Largue were aimed more at being a lively daysailor rather than an all-out racer. 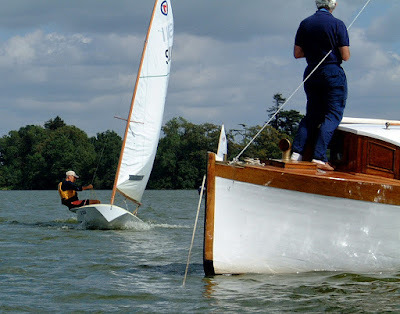 Below are some of the photos taken by Marc Morell during this Classic Moth regatta. The French vintage Moth Nantais is very similar to the American Dorr-Willey and Ventnor vintage Moths. The red hull Nantais has an enormous bubble-deck (which was one way to keep these small dinghies dry before the invention of bailers and double-bottoms). Mariposa, which was featured in a blog post on Earwigoagin is the blue hull on the right. The purple, transom-bowed, plywood, V-shaped Bilbon (foreground, designed by Christophe Couton) was the best of the new designs at the competition but I'm guessing it was still off the pace compared to the Olympic Europe Dinghy (leading to the left). The transom-bowed Swiss Fragniére was the most popular French Moth of the late 1950's to mid- 1960's. Here is one with a wooden mast approaching the finish line. A 1960's video short featuring some Fragniére's can be seen here. Julia, the yellow Moth modeled after the Laser shape, designed by Didier Laveille. The purple Bilbon from Christophe Couton. Another new design, the black hull Berga' Moth put together by Jerome Amouraben from the Nantes School of Architecture. Julia, the Moth with Laser-like hull sections. I mentioned in my post about the American International 12 that there is also what is referred to as the European International 12, the George Cockshott lapstrake, 1912 design, lug-rigged dinghy which is particularly popular in both Italy and the Netherlands. The Italians refer to the class simply as the Dinghy 12 and they race both a fiberglass and a classic wood version. 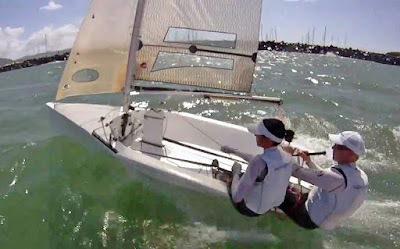 Here is another well done video on the Italian Dinghy 12. 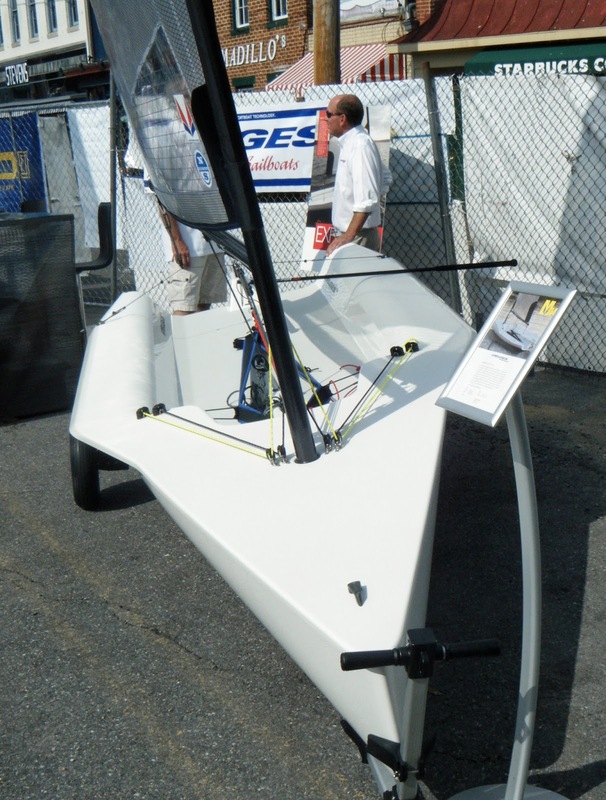 Melges Performance Sailboats introduced their Melges 14 singlehander at this years Annapolis Sailboat Show. 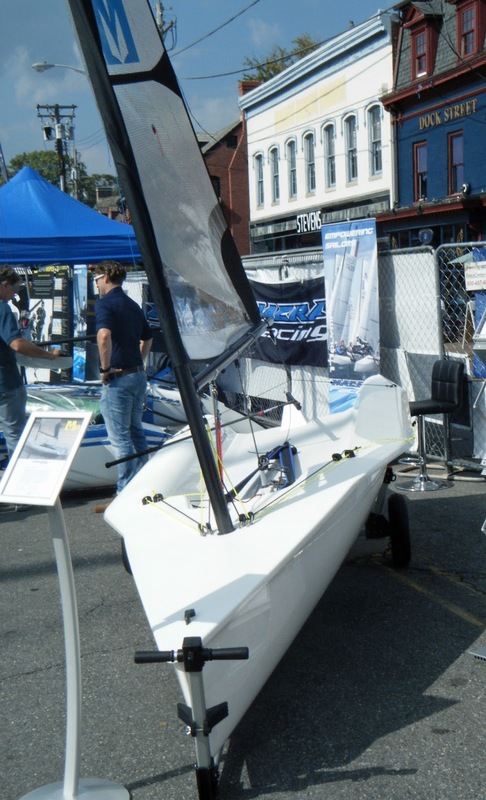 The 14 is one of the new generation hiking singlehanders; a racier, speedier alternative to the Laser and, at the Annapolis show, the Melges 14 was on display only six meters apart from one of the first entrants in this market segment, the RS Aero. A wider beam allows more hiking power so it is not surprising that in comparing sail areas between the Melges 14 and the RS Aero, the Melges 14 again comes out bigger. The Melges 14 big rig is 9.1 meters vs the RS Aero 8.9 meters and, in the mid-range rig, the Melges 14 is 7.8 vs the RS Aero 7.4. Usually more horsepower may give better light wind performance but I haven't yet seen any side by side performance comparisons published. The ultra-lightweight RS Aero hull comes in at whopping 25 kg less than the Melges 14 which, at 54 kg. is lighter than the Laser by about 5 kg. One of the benefits of the smaller hull of the RS Aero is less surface area which translates into a lighter hull. The Melges salesman countered as he made the pitch for the heavier Melges 14 hull. "How light can you go before sacrificing durabiltiy?" The RS Aero came out early in this market (not quite two years ago), is being marketed agressively and the factory in England is pumping a goodly number out every month. 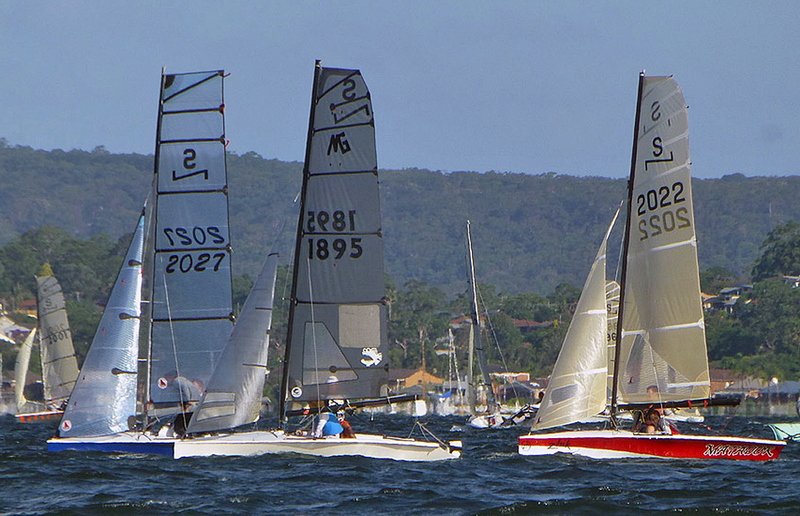 In contrast, the Melges 14 appears a little late. I asked the Melges salesman about this and being a good salesman, he remained nonplussed. Admitting there is "quite a bit of competition" in the new singlehanders, he pointed out that Melges has already built 40 of the 14's and they expected that the existing customer base of Melges products (from the 20, 24, 32, the myriad Melges scows) would initially provide a steady stream of buyers for the 14. There you have it. The Melges 14 is a bigger, heavier (though lighter than the Laser), more powerful (with a very roomy cockpit!) entry in the hiking singlehander marketplace. I have no idea how it compares on the water with the RS Aero or the D Zero (which has yet to put in an appearance in North America - Correction, there are three in North America - see bottom of post.). 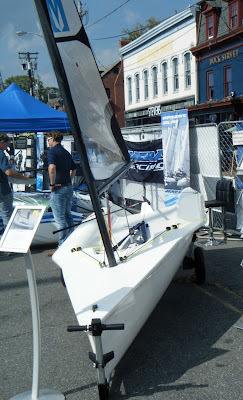 Price for a Melges 14? It seems to be moving target but somewhere around 9K U.S.
Also check out the Tillerman blog post on the Melges 14. The Melges 14 has a mylar sail on a carbon mast and boom. (This is different from the RS Aero which has remained with the tried and true dacron sailcloth.). The Melges 14 also is round-bilged but one thing you can't do very easily at a boat show is turn the dinghy over and inspect the hull - so I can't comment on the hull shape. This photo taken from a more bow-on angle definitely shows the very distinctive straight gunwhale line (seen also on the RS Aero - this provides flare at the gunhwale and more hiking power) starting just forward of the daggerboard case. The wide flat cockpit and more beam means there are two hiking straps instead of the usual center one. 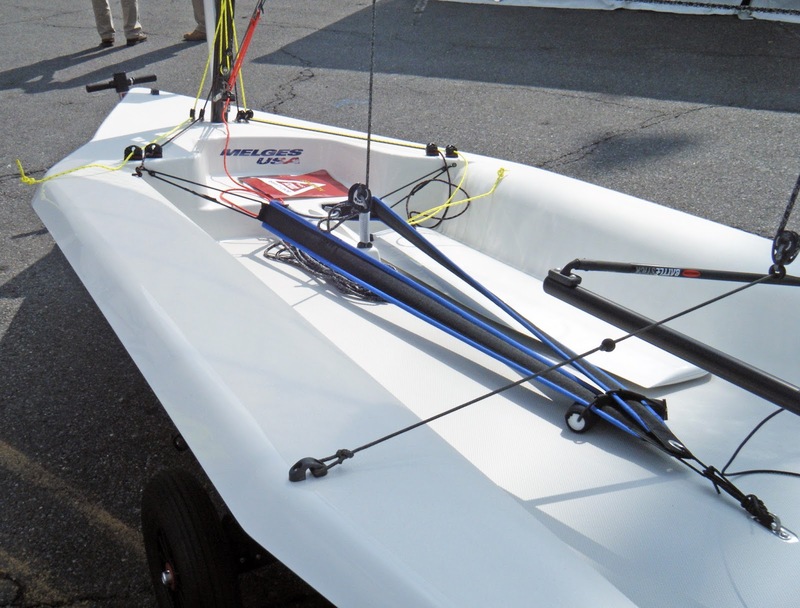 The Melges 14 uses the typical Laser split mainsheet rig with a transom bridle. I forgot to ask the salesman how you controlled athwartship boom placement as there doesn't seem to be any control lines for the aft bridle, just a stopper ball on each side. Boom vang control is at the mast, the other cleats are for the cunningham and outhaul. 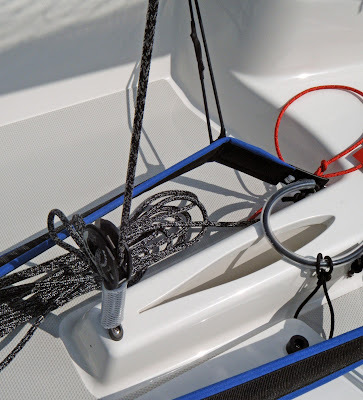 The mainsheet turning block uses a a nifty hose to hold it upright (versus those metal springs). 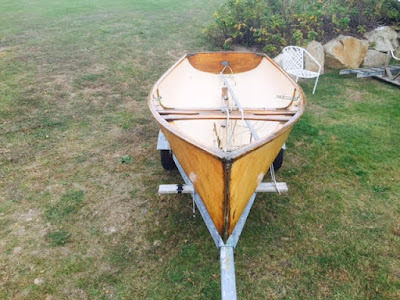 The Melges 14 has a small raised shelf just forward of the daggerboard trunk, ending some 100-200 mm aft of the mast - probably a tricky engineering tweak to provide structural support to both the front of the daggerboard trunk and the mast. (I can see an aftermarket storage turtle being designed to fit this shelf - perfect for water bottles, spray jackets, sandwiches.) The cockpit also has the comfy non-skid foam that the SUP crowd invented. Over at the Sailing Anarchy thread on the Melges 14, user Woodman is of the opinion the Melges 14 is similar to the English Supernova singlehander, which is considered a big-guy singlehander. Also on the Sailing Anarchy thread, user Jeffers corrects me when I say there are no D-Zero's in North America. There are three D-Zero's now in North America. Last year's Archipelago Rally uncovered a historical gem with the entry of Yarrow Thorne's Crosby Skimmer Moth. This year, another historical rarity made an appearance at the Archipelago Rally; Woody Underwood's International 12. 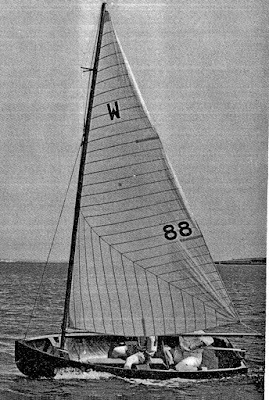 (this is the American International 12, not to be confused with the lapstrake, George Cockshott 12' Dinghy, which is also sometime referred to as the International 12 and popular in Europe.) The International 12 was the first sailing dinghy to be built using hot molded veneers held under pressure in an autoclave, a building method that allowed mass production of a very strong, lightweight monocoque wood hull. 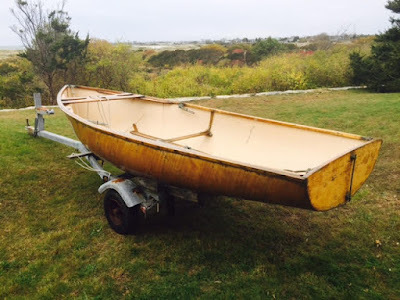 It was a very revolutionary technology but also a temporary technology as fiberglass construction of boats came to the fore in the late 1950's, early 1960's. Thousands of wood boats were built post WWII using hot molded, autoclave construction. 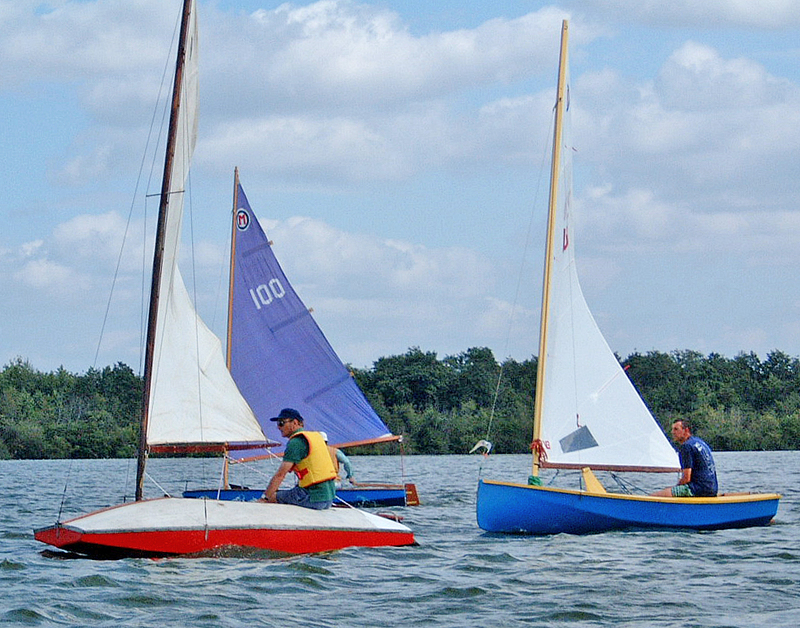 Most were small outboard runabouts but some are the familiar sailboats of today including the Fairey Marine and USOD International 14's, Thistles, Luder 16's, Fireflys, Jet 14's, and Jollyboat. 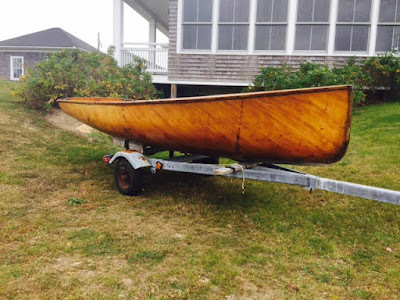 "My father bought this boat (# 31) in 1940, and it could be the first boat I ever sailed in. He was away in the service after that, and the boat was washed off its float in Padanaram in Hurricane Carol, ending up in the bushes 2 miles away. About 1960, we put in an Interclub mast, and I have sailed the boat on and off since then. Condition is good, albeit dried out. 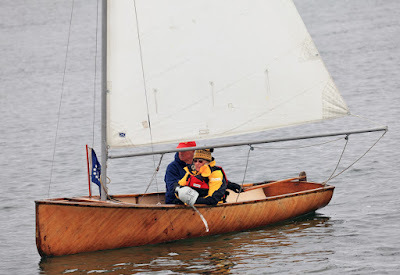 Woody and Josie Whoolam sailing in the 2015 Archipelago Rally. Woody has retained the natural mahogany veneer look on the outside of the hull. The International 12 was designed by International 14 designer, Harry Hall, who lived in New Rochelle, New York. The first hot molded boats had very little internal structure - a feature designed to show off the strength of the new construction. The lack of ribs and stringers was a source of amazement to most. 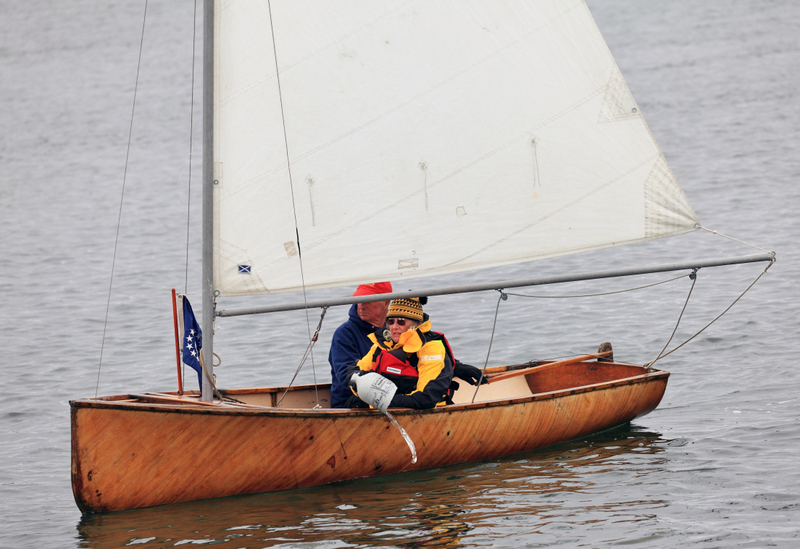 The wood International 12 was also used by the U.S. Coast Guard Academy for their sail training and dinghy racing program. Ernest Ratsey sailing the International 12 prototype in the summer of 1940. One cannot wrap up the 2015 Archipelago Rally without featuring the latest video report from the Tuthill Sisters. Last year, in the 2014 Rally, the younger sister had to become a human sidestay when the mast on their dinghy started falling over. This year the duo rolled out a Sailfish for the race, a choice that looked like a safe bet compared to their previous rickety dinghy and the slow - slow Snark, but the Sailfish has no cockpit and, sometime during the race the older sister ended up in the drink (she kept filming though). The previous header photo was of a Blue Jay drifting during the 2014 "Polly's Folly" regatta on Lake Megunticook, Maine. Two of the "Free-for-Alls" that I listed were cancelled this year; Polly's Folly because of a conflict with a Laser regatta, and the MASCF at the Chesapeake Maritime Museum because of Hurricane Joaquin lurking offshore during the first weekend in October. The Archipelago Rally went off without a hitch with over 40 extremely diverse small boats. Fellow sailing blogger, Tillerman, almost won this year's Rally in his RS Aero. The Sebago Cup was mostly an event for the local Sebago Canoe Club's Laser and Sunfish fleet. The 2015 NSHOF Classic Wooden Sailboat Rendezvous had only one dinghy registered this year. There was, however, a large fleet of restored Stars. My friend, Tom Price, had his 1959 Lippincott racing and sent along this report. "We launched at AYC on Saturday but it was too rough in the City Dock basin for us so we hauled out again. On Sunday we relaunched and raced. It was a very nice day contrary to predictions, never getting over 15. 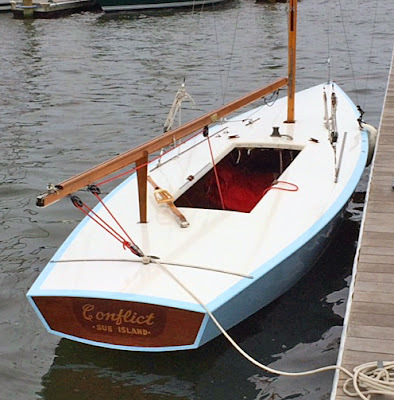 "Conflict" (and John Sherwood - both classics) did well despite using our 1963 sails (because of their cool yellow color). Keith Donald won with his fully modern wood Star and we were second beating Elliott and # 177 "Trout". Nothing broke and we felt quite comfortable. I did the clinging vine style hiking and it suited the placement of cleats and winch perfectly. It was all reaching so the Stars didn't shine overall ( we were the last start ) but it was a real blast. Tom Price's restored 1959 Lippincott Star at the AYC dock.